There is no denying that choice improves the quality of our lives. It enables us to control our destinies and to come close to getting exactly what we want out of any situation. Choice is essential to autonomy, which is absolutely fundamental to well-being. Healthy people want and need to direct their own lives. Freedom is essential to self-respect, public participation, mobility, and nourishment, but not all choice enhances freedom. — Barry Schwartz, The Paradox of Choice; Why More Is Less. 85 different varieties and brands of crackers. Sodium? Or no? Fat-free? Big box or small? Normal or bite size? Domestic or import? 285 varieties of cookies. 21 options for chocolate chip cookies alone. 13 sports drinks; 65 box drinks for kids; 85 other flavors and brands of juices, and 75 iced teas and adult drinks. The tea drinks could be sweetened with sugar or artificial sweetener, or flavored. I’ll stop. He goes on. For several pages, actually. We have freedom to choose. Freedom of choice. Awesome, right? Not right; crazy. Seriously. And this is only groceries! Let’s shift gears. Let’s consider something less tangible than groceries, but no less important: information. More specifically, educational, instructional material. Digital, at your fingertips, download-now-at-4G-speed-and-start-your-homework instructional material. You think there’s a few choices out there in this arena? Over the next twelve months, do you think the quantity of those choices will increase by a factor of five? Ten? Fifty? Is it any surprise that we are susceptible to decision fatigue? 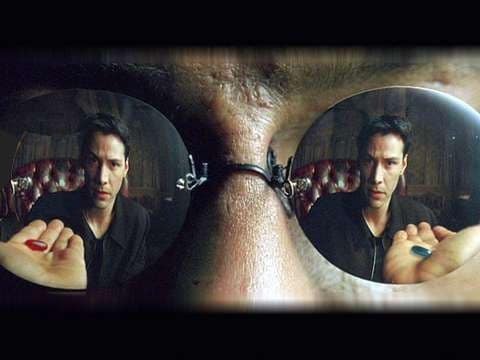 Neo was right; in a very real sense, the problem is choice. Because now, more than ever before, there are real and specific consequences to this proliferation of choice. One common byproduct is paralysis. We find it difficult to choose at all. One study of 401K plans revealed that as the investment options for a 401K increased, the percentage of people choosing to participate in the plan went down. There was actually a correlation: add a fund, lose a participation percentage point; add another, lose another… People facing more choices chose not to choose! … the odds are raised that we blame ourselves for not being able to sufficiently process the myriad of choices available to us. But with every problem there is opportunity, no? Is there now, paradoxically, opportunity for peace and profit in providing freedom from choice? Can a sales executive that can skillfully limit the choices for her customers actually raise the odds of closing the sale? Can a software program that can meta organize all that digital instructional content — to make a selection on a specific topic more manageable — produce a stampede of users? Choice is good, but more choice is not better. Because not all choice enhances freedom. Although the prisoners from the last post may not be on board with that sentiment. P.S. : Watching the video of Barry Schwartz’s TED talk is highly recommended and highly enjoyable! 2) Ever try to pick the right light bulb among the dozens of choices (incandescent, CFL, halogen, LED, lumens, wattts, “color”, start speed, energy consumption, life expectancy)? How do you make the right value decision? It’s a wonder my house has lighting that works (bet I could have chosen “better”). 3) I’ve realized (and it took me a long time to figure out) that when I am away from home on vacation, when I intentionally limit my exposure to TV, radio, newspapers, online information, etc. ), that I am a MUCH happier person. Maybe “You’ve got no mail” will be the therapeutic catch phrase of the future? I admit that I was a big believer in giving people options; recommending scenarios; alternative approaches… I thought I was empowering them. I now know that I am only introducing complexity. I need to think harder through the options and propose what I think will work best. Awesome to see you continuing to visit and comment!